How many times have you wanted to conduct a meeting, yet the board room is booked? Millions of meetings take place every day, and the vast majority only involve a few people, minimizing the need for a big board room and the accompanying large screens in order to share the information they need. 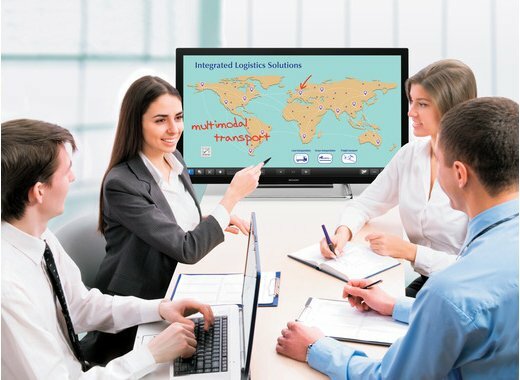 Sharp has developed a 40” BIG PAD interactive touch screen kiosk device that is ideal to share ideas, host conferences and work collaboratively. Lots of companies are creating small informal ‘break-out’ spaces where staff and clients can meet to discuss ideas and work through projects. The touch screen kiosks are designed with two to six users in mind, and are even equipped with audio visual systems to enable conference calls. The Sharp BIG PAD PN-40TC1 has been designed to specifically meet the needs of break-out spaces, known as huddle spaces. The compact screen offers all the features found on the larger screens, but are cost effective to deploy. This touch screen kiosk is the smallest, most compact interactive display in the BIG PAD range, making it ideal for smaller meeting spaces. It can be wall mounted, for permanent break-out spaces, or placed on a trolley making it mobile for different teams and departments to benefit. The modern office comprises of staff with multiple connected devices and with the Sharp BIG PAD PN-40TC1 users can quickly connect to the interactive display with their device of choice. Using the wireless LAN board inserted into the Mini OPS expansion slot, the Sharp Display Connect software app easily connects and shares information between the BIG PAD and up to 50 tablets, smartphones and other devices simultaneously, so you can write, share and collaborate in meetings far more intuitively. One of the key areas of any Huddle Space is making it affordable to implement and maintain. By creating a smaller and more compact screen yet still retaining all the features businesses have come to expect from the BIG PAD range, the Sharp BIG PAD PN-40TC1 offers a more cost-effective but equally efficient solution that gives collaborative workers everything they need.